Less well known is that Erdogan's daughter Sümeyye supervises a secret hospital setup by Erdogan in Sanliurfa to look after Daesh jihadists. 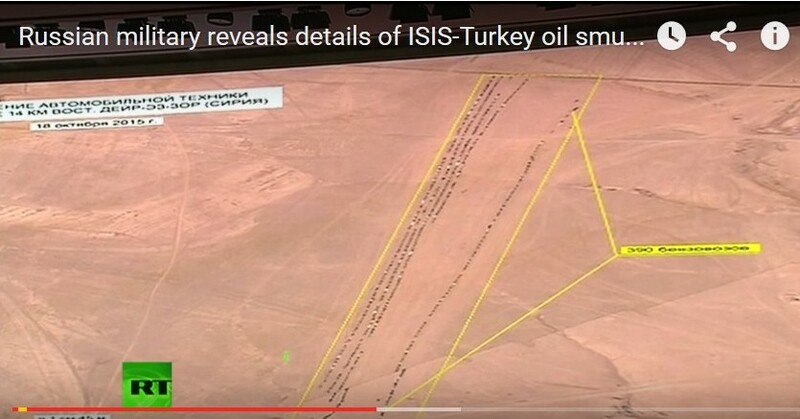 For the past year the US has banged on about it fighting ISIS / Daesh and at the same time the mainstream media has made it known that ISIS was being financed by stolen oil to the tune of hundreds of millions, possibly a billion per year. 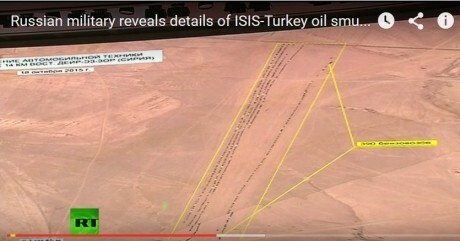 Yet somehow the entire US intelligence state with it's satellites, global intercept capabilities, advanced surveillance technologies of the US air force with it's fleet of drones, AWACs and other planes, never seemed to find any of the oil tanker trucks shipping this oil nor has a single one up to very recently been attached. However over the past two months with the start of the Russia air campaign attacking targets things have changed. 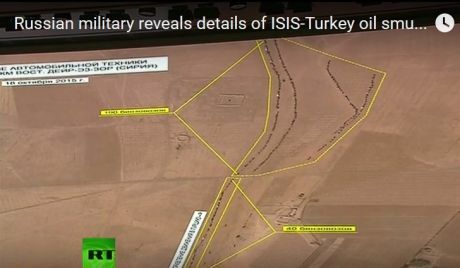 The regime plans of Turkey, UK, France and USA for Syria have been upset temporarily and their blatant support for ISIS exposed and completely embarrased and made obvious to the public how ineffective the US & co campaing was in light of the huge success of Russia in the space of a few weeks doing inflicting a lot of damage on ISIS. 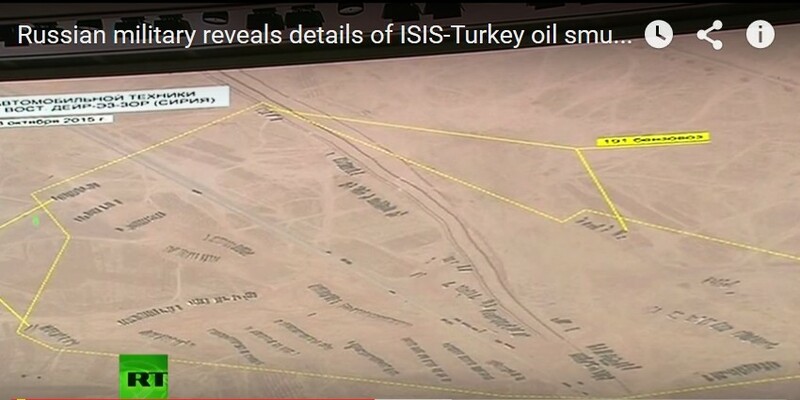 After the Paris attacks, the US had to do something and finally attacked over 100 ISIS oil tankers. There are reports that a leaflet drop was done 45 mins in advance to advise everyone to run away as an attack was immiment. It's a pity the 2,000+ civilians (and these are US military figures) killed by drone strikes over the last few years never got the same warning. 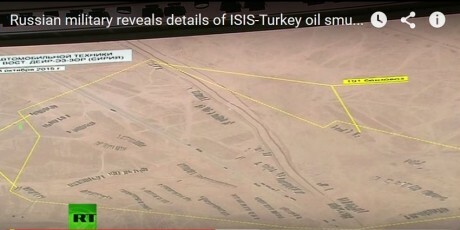 In the same week though Russia upped it's air campaign and destroyed over 500 ISIS oil tankers and have since gone on to destroy many more including oil storage tanks so as to disable the infrastructure to enable the large scale looting of the oil. 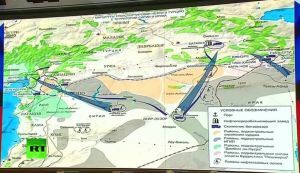 While the US attack was a token gesture to keep up appearences, the Russian attack hurt the Erdogan's badly and he was mad that the Russians would dare disrupt his criminal entreprise. 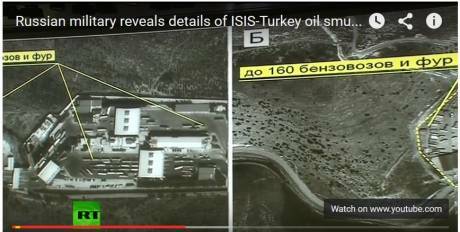 It was widely speculated by many commentators that the shooting down of a Russia SU-24 aircraft in Syria by a Turkish F16 fighter was in retaliation for the attack on the oil tankers and attempt to warn Russia, although it had the opposite effect because they intensified their air campaign against the ISIS monsters. 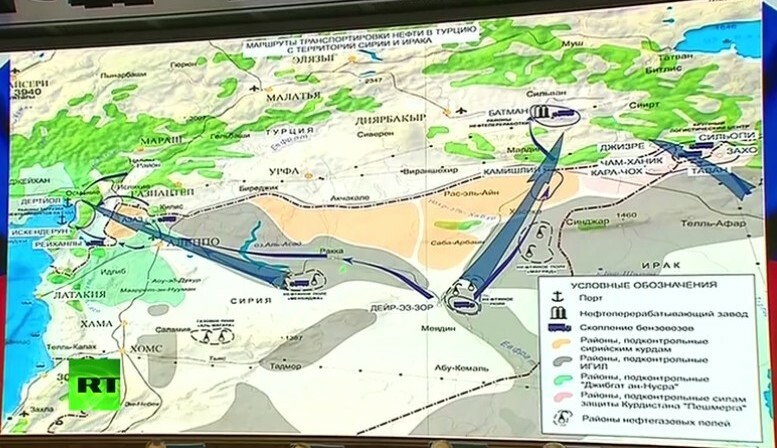 It should be pointed out that on a surface level this may have been how it played out, but taking in the larger geopolitical context, driving a wedge between Russia and Turkey plays to the advantage of the US, because it means the loss of trade with Russia while hurting Turkey, hurts Russia too. Also the Turkish Stream gas pipeline from Russia to Turkey and onwards to the Balkans is at best now on hold or possibly cancelled. The Balkans are traditional allies of Russia and undoubtly one of the objectives of Turkish Stream was to help strength those again. 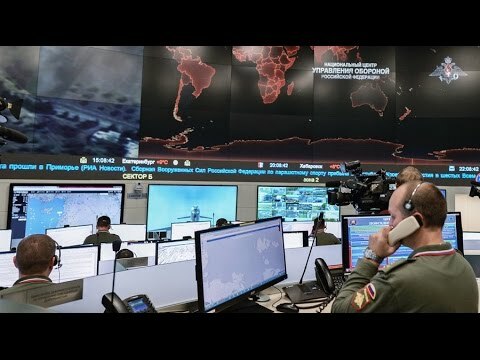 While the US has in public supported Turkey in the whole affair they still let it be known through a leak reported to Reuters news agency by an anonymous American military official that the Russian plane was downed while over Syrian airspace which is another way of the US saying to Russia we know. 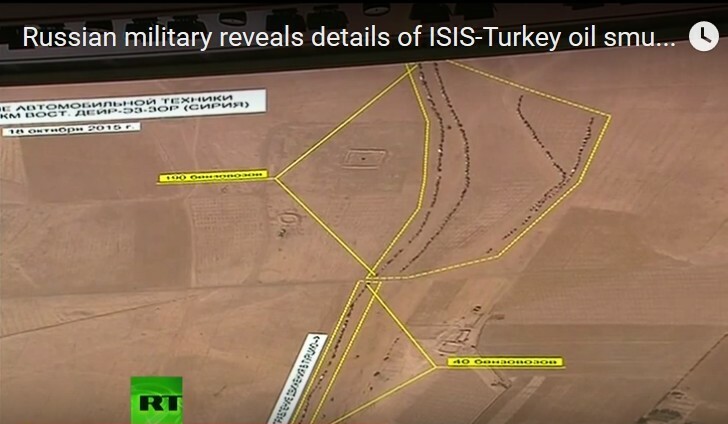 This suggests something deeper to that particular event and may relate to the speculation of a coming civil war in Turkey where so far Erdogna has been the fall guy and the planned end result is the setup of a Kurdish state -aka Kurdistan. This has been the goal of the neo-cons from the early 2000s. The general idea was to smash up all the larger states and fracture them into smaller ones, each then more easily controllable. Iraq is defact more or less on the way to being divided into three states. Libya is a failed state. 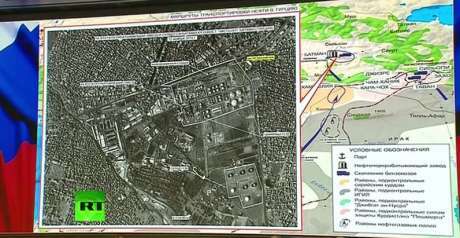 Syria is the present target and Iran is the main target, at least in that part of the world. But for the moment, the focus of this article is on the presentation made on Weds 2nd Dec 2015, the Russian military presented comprehensive and devasting evidence (for the Turks at least) of the large scale of the ISIS oil smuggling through Turkey and the complicity of the Turkish state in this massive criminal entreprise and for their support of these butchers who have ruthlessly murdered tens of thousands, beheaded people and destroyed some of the greatest archaeological that were treasures of all humankind. 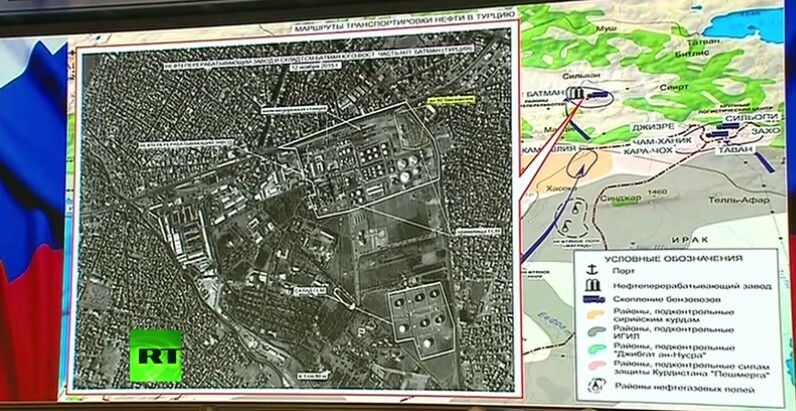 In the presentation they illustrated the scale of the operation and how the oil is transported to Turkey. It goes via three routes (see map), the Western, Northern and Eastern route. 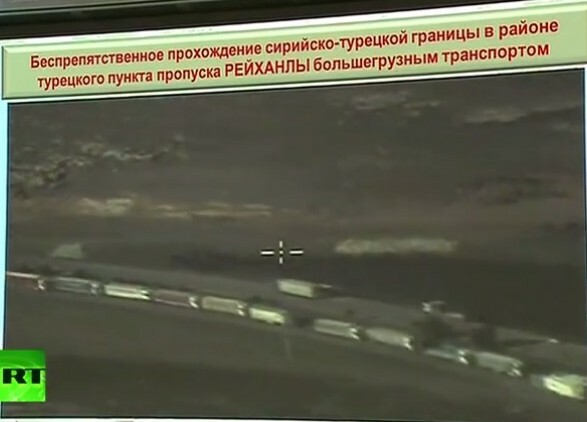 There are thousands of oil tanker trucks (8,500 per day) used which are driven at night over the Syrian-Turkish border where they let through without any hinderance. It is reckoned they were making approximately 3 million dollars per day which works out at around 3x365 = 1 billion+ dollars per year. 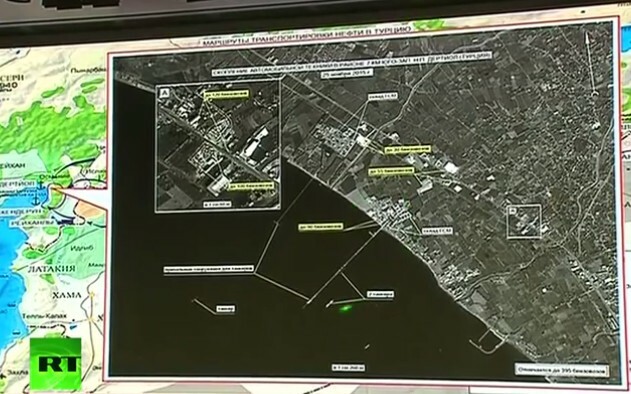 Some of the oil is exported through the ports of Dörtyol and Iskenderun on the South coast of Turkey and the rest sold within Turkey with the Turks taking their cut for services rendered. 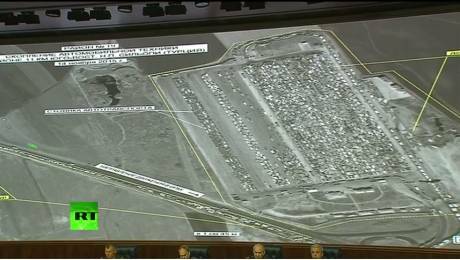 In the presentation a series of aerial and satellite photographs illustrated each point. 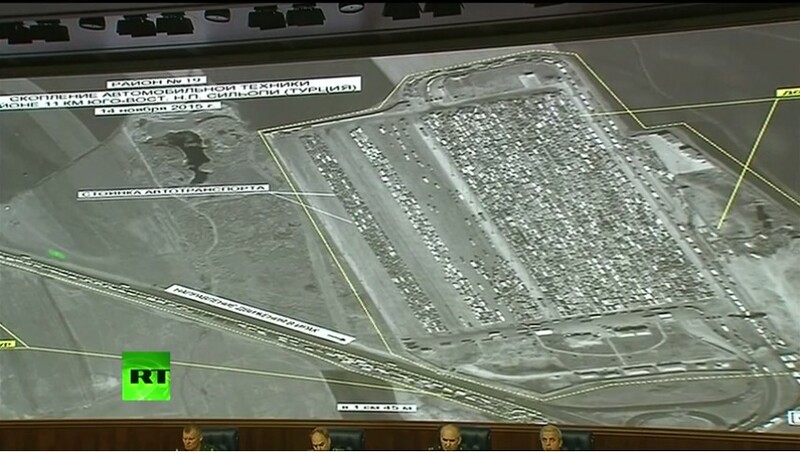 On the Eastern route, one satellite image, dated the 14th November 2015, shows the presence of 3,220 tanker trucks crossing the border into Turkey via the crossing point at Zakho. 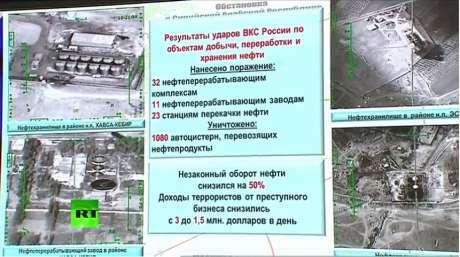 So far Russia has carried out air-strikes on 32 petrol complexes, 11 refineries, 23 pumping stations and 1,080 tanker trucks transporting petroleum products. The result for the IE is a loss of 1.5 million dollars per day yet ISIS are still receiving money, arms and munitions from their sponsors abroad. Isn't that incredible after all the coverage in the Western press about ISIS?? Does that not wake up some people from the incessant propaganda covering up their role in the creation of ISIS? Hakan Fidan, the head of Turkey's National Intelligence Organization, known by the MIT acronym, has drawn a lot of attention and criticism for his controversial comments about ISIS. Mr. Hakan Fidan, Turkish President's staunchest ally, condemned Russian military intervention in Syria, accusing Moscow of trying to 'smother' Syria's Islamist revolution and serious breach of United Nations law. “ISIS is a reality and we have to accept that we cannot eradicate a well-organized and popular establishment such as the Islamic State; therefore I urge my western colleagues to revise their mindset about Islamic political currents, put aside their cynical mentalité and thwart Vladimir Putin's plans to crush Syrian Islamist revolutionaries,” - Anadolu News Agency quoted Mr. Fidan as saying on Sunday.